Jackson State University (JSU) is a four-year, state-supported, coed, liberal arts university. It wa…. Jackson State University (JSU) is a four-year, state-supported, coed, liberal arts university. It was founded in 1877 as the Natchez Seminary by the American Baptist Home Mission Society in Natchez, Mississippi. The purpose of the seminary was for the moral, religious, and intellectual improvement of Christian leaders of the colored people of Mississippi and the neighboring states. In 1882, the institution moved to Jackson because of its central location in the state, and shortly thereafter the name was changed to Jackson College. For sixty-three years the school operated as a private church school. In 1940, the college became a state institution for training rural and elementary school teachers. The first bachelor’s degrees were awarded in 1944. In subsequent years, the name changed to Jackson State College. Expansion of the curriculum and facilities elevated the college to university status in 1974; thus, the name changed to Jackson State University. In 1979, Jackson State University was officially designated the Urban University of Mississippi, and as such, seeks solutions for urban problems through its programs and activities. The University is pledged to the advancement of a free society and continued progress of democracy. In 1983, the University completed an .2-million capital campaign that resulted in the renovation and improvement of several campus buildings and provided for expanded programs offered in continuing education. Jackson State University is accredited by the Southern Association of Colleges and Schools (SACS) to award Bachelor of Arts, Bachelor of Science, master’s, Education Specialist, and Doctor of Education degrees. Percentage of students receiving financial aid: 90 Financial Aid Specific to the School Army ROTC offers two- and four-year scholarships that pay tuition, fees, books, and other expenses and provide a monthly stipend. Graduation from an accredited high school (or equivalent) and submission of an official transcript with the following units: 4 English; 3 mathematics (algebra I, algebra II, and geometry); 3 science (1 lab, biology, advanced biology, chemistry, advanced chemistry, physics, or advanced physics); 2 1/2 social sciences (U.S. history and American government); and 1 elective. Recommended requirements include 2 units of a single foreign language, mathematics in the senior year, a computer course, and typing proficiency. Proof of immunizations for measles and rubella is required. No application fee is required. Admission Application Deadline: August 15 (fall); December 15 (spring). 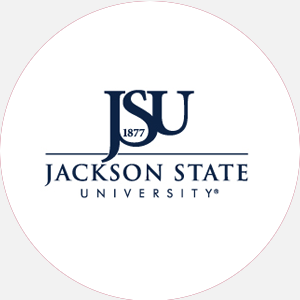 Admission Contact: Director of Admissions, Jackson State University, P.O. Box 17330, Jackson, Mississippi 39217; Telephone: 601-968-2100 or 2237; 800-848-6817 (toll-free). A minimum of 128 credit hours and completion of the core requirements, including 15 to 21 semester hours in communications, 9 semester hours in natural science, 12 semester hours in social and behavioral science, 2 to 3 semester hours in health and physical education, 2 semester hours in concepts for success, and requirements in the major field of study. At least a 2.0 cumulative GPA and a 2.0 cumulative GPA in all courses in the major field of study is needed. Thirty hours of upper-level work in the major must be completed at Jackson State. Must pass English proficiency exam. Campus Services: Health center, personal and psychological counseling, career planning and placement, and transportation to some off-campus housing. Campus Activities: Social and cultural activities include theater, musicals, orchestra, chorale, and dance. Interested students may work on the Blue and White Flash (student newspaper) or the Jacksonian (yearbook). Leadership opportunities are found in professional and departmental associations or special interest groups, such as the chess club, karate club, NAACP, or the Blue and White Flash, an independent newspaper on campus. Students with musical, dramatic, or dance talent may join the Orchestra Club, the Dunbar Drama Guild, or JSU Modern Dance Troupe. Greek sororities include Alpha Kappa Alpha, Delta Sigma Theta, Sigma Gamma Rho, and Zeta Phi Beta; fraternities include Alpha Phi Alpha, Kappa Alpha Psi, Omega Psi Phi, and Phi Beta Sigma. Honor societies include four general honor societies–Alpha Chi, Alpha Kappa Mu, Alpha Lambda Delta, and Phi Kappa Phi–and fourteen departmental honor societies. The Religious Council consists of seven clubs of various faiths. Housing Availability: 2,596 housing spaces; four men’s dormitories, an honor dormitory, and two large women’s dormitory complexes.